This report and commentary is long overdue but it couldn’t be helped due to the sensitivity of the communication and work being done the last few days. We simply could not openly report all the details we are now going to share. On Thursday, July 17, 2013, I received a surprising “Abuse” email notification from my web hosting provider. I immediately distributed this email internally to the ELI Defense Team. My reply to the web hosting provider was the following. I must tell you that I am truly angered by this email as this is the first of its kind ever sent to me. I have been a good-paying customer for years of eapps and have weathered some disruptive servicing in recent years. 1. My first request is that I receive a copy of the complaint issued to your company. 2. My 2nd request is that I would like to know which pieces of information has been deemed inappropriate and considered Stalking & Harassment. Without hiding behind technicalities, I suspect you are referring to content listed on extortionletterinfo.com. The content that is posted does not fall into any remotely illegal or criminal behavior. Further, as a reporting website, any information posted is generally accessible on publicly accessible websites. The nature of the reporting of the website is to assist those in the “legal extortion business”. The people we report on are those who persistently and regularly make legal threats without follow-through. It is being used as a club to extort money. You should also know that many of your fellow hosting providers actually refer people to us as we are the only ones who help protect small business owners, bloggers, and the like combat legal extortion threats. I understand the text of what you’re saying but unfortunately, you clearly do not understand the context. The legal extortion we report on has been reported by others such as bloggers and news reporting agencies on a national basis. I work with a highly regarded copyright and intellectual property attorney. We have hundreds of incoming referrals as the definitive source in combating legalized extortion. What is happening is that YOUR company has now become embroiled in this by attempting to censor our quite legal and factual content. You do not know the full context of what is going on. Further, I would rather move all of my websites than be subject to this removal threat. If you are going to listen to a 3rd-party extortionist over a good-paying customer in good-standing who has no history in controversy and who advocates for thousands of people worldwide against legalized extortion, you are on the WRONG side of this fight. By virtue of the complaint you received and threat you have issued on my account, it now opens reporting to a whole different front where copyright extortionists want to complain to a hosting company because people are choosing to fight back. I urge you to reconsider this request and I request a callback as soon as possible. I am happy to speak with you further about this matter but as it currently stands, it appears you are forcing me to relocate my websites. I received a reply from Rick, owner of the web hosting company. Barry or I will call you within the next day or so if you sincerely desire to have a conversation. I will tell you in advance that it will not change our position. You are going to have to remove the posting of the residence picture and address, remove all references to implied violence such as “kill” and “dead” and draw the line in closer on your forum if you want to continue to host it with us. We have this right under our terms of service. For the record, I do not know what you are referring to regarding the words “dead” and “Kill”. I would agree if these are physical or death threats, I would entirely remove these as they are highly inappropriate. These would NOT be tolerated. We do not condone unfettered discussions, actions, and free-for-alls. There are limits to what is allowed. However, you have not provided me with samples of the offending URLS, nor have you provided a copy of any complaint so that corrective measures can be taken. With 13,000 posts, how am I supposed to quickly find the offending posts? You said 4 people agreed several posts cross the line. Which posts are these? Regarding the residence pictures and addresses, I believe they are hot-linked and do not reside on the eapps servers. And regarding the addresses, these are publicly accessible information. I understand the rights of eapps. I am trying to determine whether your requests/demands are something we can live with or if we need to move the site. With only vague descriptions of what the offending posts might be, it is not very helpful. We seem to disagree with what is considered stalking or harassment. Shortly thereafter, I called in to speak with someone to get more information on the complaints. I found it very peculiar that blanket statements would be made without us being given specifics. I asked WHO made the complaints and I also wanted to get copies of the actual complaint. My requests to get copies of the actual complaints were refused. I then stated that we should at least be given the specific URLs of the content in question if the actual complaint letter was not going to be provided to us given that we have over 13,000 forum posts and that we can better evaluate the actual content being complained about. The complainant has indicated that there are other URLs potentially involved as well. If this is the case, these will also need to be addressed. Please go through your forum and ensure that there are no references of any sort that could be seen as potentially inciting violence or criminal behavior. You will also need to remove any unauthorized personal information such as home addresses. Once I received this email of the URLs in question, there were no doubt complaints were filed from the Linda Ellis (The Dash Poem) camp. Further, given Rick’s earlier reply about how he was NOT going to change his position and the requests made in the very last paragraph of Lynn’s email, I saw no other alternative but to relocate the ELI website and the ELI Forums entirely. Everyone should understand that I absolutely hate changing web hosting providers. The work and energy involved into changing hosting providers is often considerable and stressful. Further, there are always technical glitches in any conversion. Nevertheless, in order to preserve ELI’s existence, the only way out was either to meet the requests being demanded of us by the web hosting provider or to move on to another web hosting provider. Let me be clear, my first choice was to find as many ways to comply as possible to prevent the need to relocate the ELI website and ELI Forums. But given the fact they were requesting ELI to take down publicly available information (such as Linda Ellis home address, and a publicly accessible photo from Google Maps) was simply going too far. The notion that ELI incites physical threats and violence was and continues to be laughable. The fact that anyone believes this shows their ignorance and stupidity of what and how ELI does things. Complying with this sweeping paragraph without specifics was simply unacceptable and essentially sealed ELI’s fate of having to make a sudden exit. I had no intentions of debating or going back and forth with the management team of the web hosting provider while Linda Ellis’ camp secretly and quietly pulling their strings from the background nitpicking every forum post that has ever been made about her copyright extortion operation. I was willing to go back into the ELI Forums and tighten down the posting policies and prune those posts that may be construed as “stepping over the line”. However, I was NOT going to let any copyright extortionist continue pull the strings of my web hosting provider. They had no spine and it was quite evident. I emailed a short reply to the web hosting provider as a “safety measure” that we were responsive to the complaint. Thanks for providing the offending URLs so we can review them. You will be happy to know that we have temporarily taken down the entire forum as we sort through all of the issues. You can be assured we will resolve this issue on our end with as much expediency as we can. As far as I was concerned, I would rather shut down the entire ELI Forums first to preserve ALL the posts/content we had thus far than to start deleting and modifying forum posts under the threat and pressure of a web host shutdown. Once modified or deleted, forum posts would be difficult to restore or recover. 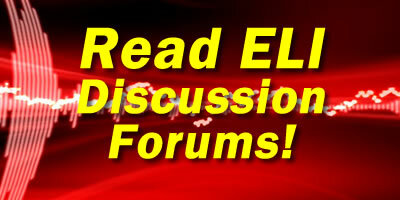 By shutting down the ELI Forums, any complaints of controversial forum posts/content was nullified immediately. We then had the time to formulate and execute a plan to get out from under this threat. While New York Attorney Oscar Michelen continues to be my business, legal, and strategic partner on ELI, Robert Krausankas aka BuddhaPi is my administrative and technical partner in the daily operations of ELI. He helps me oversee the operations of the ELI blog, ELI Forums, ELI Document Library, and ELI Facebook Page. For those who don’t already know, Robert continues to generously volunteer his time, energy, and efforts into the ELI Project with no financial compensation. In many ways, Robert has become the critical 3rd leg supporting me and Oscar in keeping ELI robust, active, expansive, controversial, cutting-edge, and moving forward. Prior to this incident, Robert has long offered his company’s web hosting services to me and ELI. I always declined his offer because up until last week, there was no reason to move ELI or the ELI Forums anywhere else. After my web hosting provider made their position clear, I knew ELI needed a new home. And that new home would now be with Web Design of Palm Beach owned and operated by none other than our own Robert Krausankas. Few people know or understand more about the importance of preserving ELI’s editorial freedom, preventing censorship, allowing reporting freedom, and sharing open commentary than Robert. From the afternoon of January 17, 2013 to the morning of January 18, 2013, I committed many long, grueling, and tedious hours to convert and move the ELI website and ELI Forums to the web servers utilized by Web Design of Palm Beach. And from January 18, 2013 to January 22, 2013, Robert took over resolving all the remaining bugs, glitches, and other unexpected technical issues as a result of the sudden change and move of a highly-trafficked website. On the late afternoon of January 18, 2013, I issued a “final” response to the owner of the web hosting company regarding the “Abuse” email complaint. We have taken your comments into advisement and we have responded promptly. 1. Yesterday, we emailed you and Eapps that we deactivated the ELI Forums entirely so that ANY controversial content on the forums became a non-issue as we sorted and discussed the situation. 2. We have since decided and have moved the entire contents, images, web files, MySQL database, and the website extortionletterinfo.com to another web host at palmbeachdns.com. The domain extortionletterinfo.com has been removed from the eapps DNS Manager. The domain is now pointing to the DNS of the new web host. All of this can be easily confirmed by your staff. 3. Currently, we are temporarily storing backup copies of the MySQL database and the HTML-related on the eapps server. Given there is no public access to these files, there should be no issue as it is being used for simple and temporary file storage. We will ultimately purge that data and files in the weeks ahead from the eapps server once we establish the new web host is fully functional. 4. The remaining websites and content being hosted at eapps should not have any controversial content and should be well within the scope of the existing Terms of Service. Obviously, if this is not the case, you or your staff will advise me promptly as you did with the content on extortionletterinfo.com. At this juncture, I trust these actions we have taken alleviates any concerns and stress eapps may be experiencing as a result of the controversial content we were hosting. Any further complaints about the controversial content should no longer be applicable, in the realm of concern, jurisdiction, or potential liability of eapps. Unless you or your staff informs or indicated otherwise, I believe this case (as it relates to eapps) has now been now been appropriately and satisfactorily resolved. As of this writing, the ELI website and the ELI Forums is reasonably stable in its new home at Web Design of Palm Beach as Robert continues to tweak and adjust the web hosting service to accommodate ELI’s specialized web hosting needs. More importantly, ELI is now protected from bogus complaints made by copyright extortionists who can’t handle the heat. Thank you for your update. I checked and your hosting subscription, atl02.matthewchan.com, is currently paid up through 02/22/2013. eApps will not continue to provide hosting services for your account afterward. Please ensure that you have downloaded all content that you wish to keep before then as we will suspend and cancel your Virtual Machine at that time. Thanks for the notification. I will begin steps to start vacating our websites from eapps. It will be completed by February 22, 2013. It was very clear by their email that my business was no longer wanted, desired, or appreciated. Essentially, they gave me notice to pack up my digital bags and get out of their digital home. The time had come to move on anyway for reasons I will disclose at a later date.